I had in mind for a long time to make my own laundry detergent so here it is, 100% natural. It took me a while to arrive here but I finally did it. First, I had to do the laundry coconut soap and let it end its saponification process. Then I had to struggle to find the washing soda and the sodium percarbonate, and believe me it was not an easy task in Belgium. Although they are such basic ingredients I could find them only in some organic shops stored somewhere in the back. Even the lady selling them had no clue what to do with them. With these 3 ingredients gathered, I managed to make my homemade 100% natural laundry detergent. I had this recipe already from my friend so all I needed was to test it. I washed the clothes (those of my kids included that are usually full of stains) in the washing machine and when I looked at them, I did not notice any difference compared to my older expensive bought detergent. So, why should I continue to buy detergent from the supermarket that has a lot of harmful ingredients to us and to the environment when I can simply make my own, 100% natural? Later, I've test it on all kind of clothes... white, colored, dark and even for delicate ones. Impeccable ! The only difference I found was the smell. Instead of the strong smell of the bought detergent I've got a fresh natural smell of cleaned clothes. 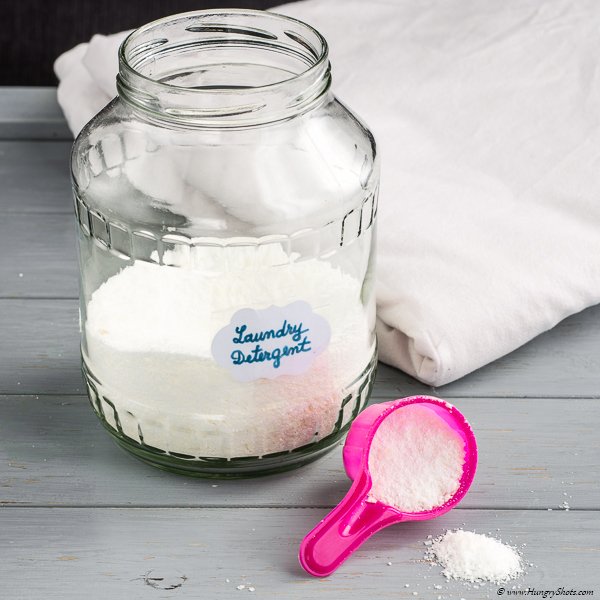 If you do not dare letting your old detergent or if you still have some bought, do like me, combine it with this homemade detergent until you finish it and after that use only your homemade one. Take a big jar or a bucket and go to a proportion of 1 to 4, mix the 2 well and use the same dosage. The soap is an obvious ingredient, because it cleans. The washing soda reduce the hardness of the water and helps your soap attack the dirt from your clothes. It successfully removes stains of grease, tea, coffee or fruits and vegetables. The sodium percarbonate comes with its properties to detach stains and dirt, to disinfect, to remove odor and not at last, as a whitener. Tell me then, what else do you ask from your laundry detergent? Just mix all these together in a jar or a closed bucket. Usage: 2 tablespoons per load.